I'm taking a break from anime backgrounds for a while (stop the presses!) 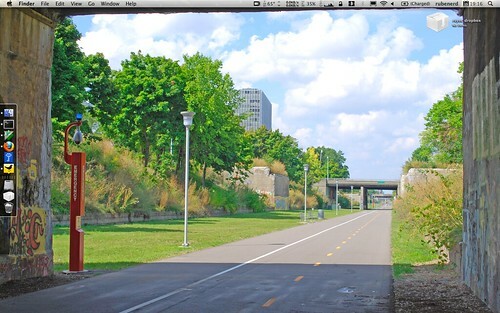 for this photo taken of the Dequindre Cut in Detroit of all places! The Dequindre Cut is a below-grade pathway, formerly a Grand Trunk Western Railroad line located on the east side of Detroit, Michigan just west of St. Aubin Street. Much of the Cut has been converted to a greenway; the colorful graffiti along the pathway has been left in place. I found it while doing research on the automotive industry, and I was spellbound by it for some deeply weird reason. Maybe it's the forced perspective, or the colours, or the way the concrete frames the monitor around the edges, or something. I don't know, I'm not a visual designer or a pro photographer. Credit goes to Andrew Jameson, if he had a link on the photo page for me to plug, I'd put it here.